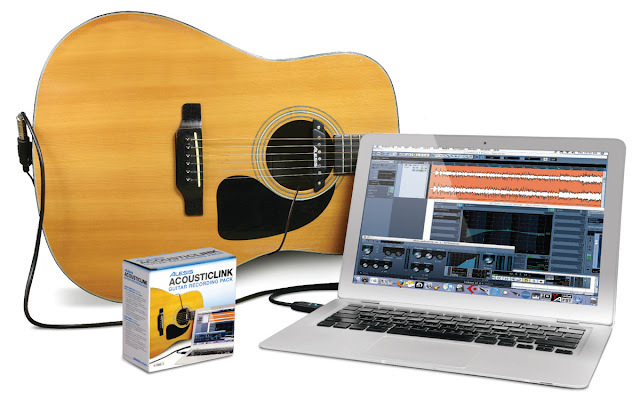 "Get your performances and ideas into your Mac or PC in seconds with the AcousticLink guitar-recording pack. The AcousticLink contains a no-drill acoustic guitar pickup, a guitar-to-USB cable, and Cubase LE recording software –– everything you need to go from any guitar to virtually any computer! You can also use the AcousticLink with virtually any music software, such as GarageBand, ProTools, or Studio One." "The AcousticLink digital recording system also works with Apple’s iPad USB connector, enabling players to record their instrument directly into their iPad using apps such as GarageBand. AcousticLink works with Mac and PC computers, with a plug-and-play USB connection that does not require any drivers or setup." 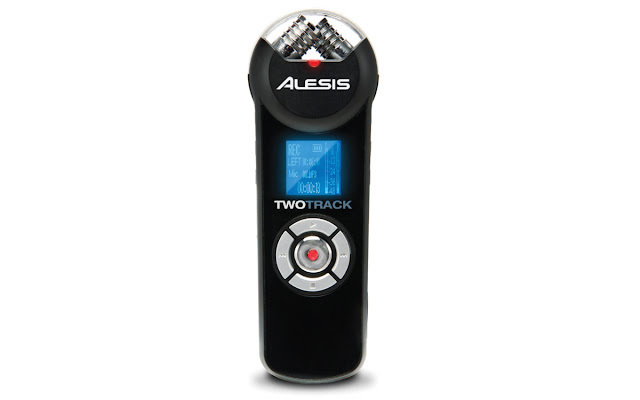 "The Alesis TwoTrack is the easiest way to record studio-quality, stereo sound in any setting. Featuring convenient, dedicated-function controls and an easy-to-read, backlit LCD, the TwoTrack was designed for everyday use in a wide variety of applications.... "
"TwoTrack is perfect for capturing songwriting sessions, rehearsals or performances. At the end of the session, users will have a 16-bit, 44.1 stereo wav file, or an MP3 at up to 192kbps that can easily be transferred to a computer via the TwoTrack’s high speed USB 2.0 output. The TwoTrack’s dual cardioid condenser microphones are configured in an XY configuration that provides excellent spatial imaging, giving users two tracks of audio that can be edited in virtually any music software. " "The TwoTrack portable audio recorder also features a convenient mic/line input for external mono or stereo sources and can even be mounted on compatible video cameras to greatly enhance the sound of video. Auto and manual gain controls and a red LED signal-clip indicator make it easy to adjust and monitor levels." Alesis is showcasing the AcousticLink and the TwoTrack at Booth #400 in the 2011 Summer NAMM show from July 21st- 23rd in Nashville, TN. When engineers mention the ATI 8MX2 the words "great sounding" "versatile" "reliable" and "lots of headroom" are often mentioned, and with good reason. The ATI 8MX2 based on the ATI Paragon ( a highly regarded live sound console) is a high quality, sturdily built eight channel microphone preamp and mixer in one. It works well in the studio as well as for live sound. The 8MX2 can be used as a summing mixer with its eight multitrack/DAW returns and multiple units can be linked. There's also a variable threshold limiter (infinity:1 ratio) on every channel. Don't be fooled by it's small footprint the 8MX2 is an extremely flexible unit that will deliver the "goods" again and again. "The extremely versatile 8MX2 rack mount preamp/mixer provides a great deal of flexibility in just one rack space. This unit is perfect for all critical digital and analog projects, including at-home and remote recording as well as live broadcast feeds. Boasting +24 db of headroom, the 8MX2's microphone preamplifiers can be driven hard without clipping. 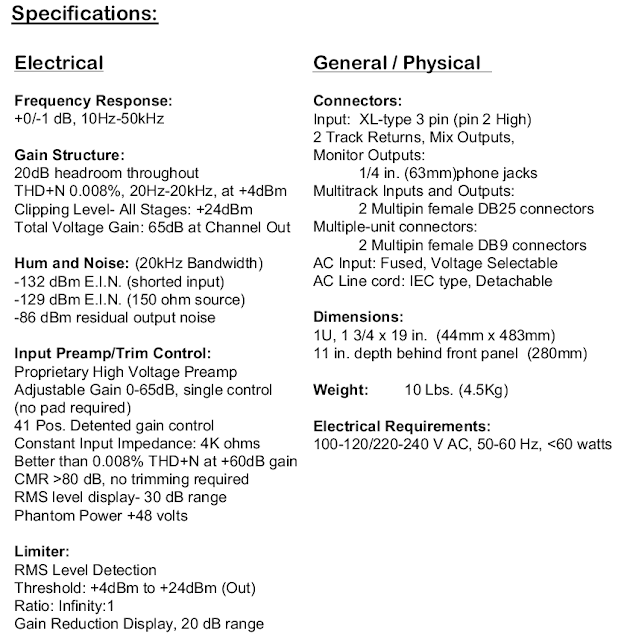 This mixer allows engineers to feed the mixbus while simultaneously feeding the direct outputs." The 8MX2 is now manufactured by API and has their industry-exclusive five-year parts warranty along with the reliability and long life all API products are known for. Trans-X is a unique dynamic processor that gives you control over transient duration and release times, to add punch, soften edges, and highlight sustain. Trans-X fixes and shapes transients, letting you change an instrument’s presence within the mix without affecting its original sonic character. Use it to tighten up the low end, add that missing punch to toms and other drums, and bring out the crispiness of hi-hats and percussion, or to soften the picking sound on bass guitar while retaining clarity and punch. The possibilities are limitless. 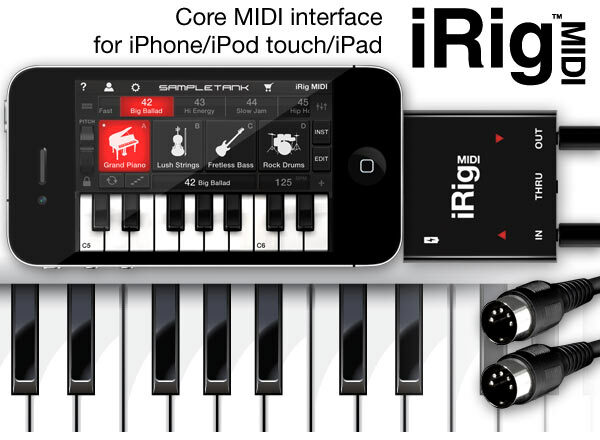 "iRig MIDI connects MIDI keyboards, drum machines, drum pads, pedal boards and more to an iOS device to control not only the includedSampleTank FREE* but also a world of MIDI-compatible apps such as GarageBand®. You can also use iOS apps to control external MIDI equipment such as sound modules, DAWs or lighting systems right from the mobile device." "SampleTank® for iOS is the mobile version of IK’s SampleTank for Mac and PC, the leading virtual sound workstation for the studio, now available for your favorite iOS mobile device and designed for live performance. It is a 4-part multi-timbral instrument with a sound set of over 1 GB of samples for over 500 acoustic, electric and electronic instruments (including a selection of the best workstation sounds from SampleTank, orchestral sounds from Miroslav Philharmonik and synths sounds from SampleMoog) plus a selection of over 1,000 melodic and rhythmic patterns that span every musical genre....."
"iKlip MINI is a universal microphone stand adapter for the iPhone® and iPod touch® to support your iOS device on stage, in the studio, at school or in the office. 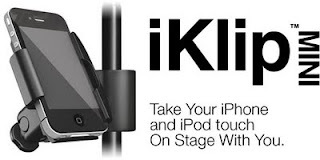 iKlip MINI securely supports your iPhone/iPod touch on any standard mic stand, pole or tripod (with diameters ranging from 11 - 20 mm /.43” - .79”) placed on the floor or tabletop." 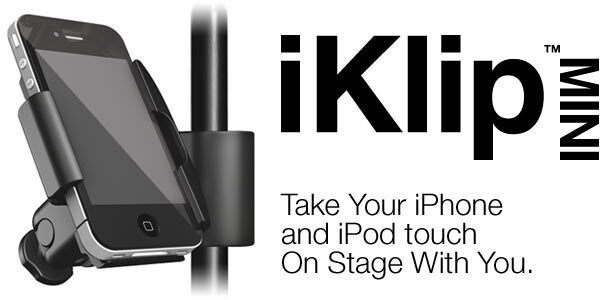 "An included detachable bracket supports our popular iRig guitar interface adapter together with iKilp MINI in both horizontal and vertical mounting positions so you can have immediate access to your iOS device multi-touch controls during your live performances with the AmpliTube range of apps or any other guitar effects app"
"iKlip MINI is also the perfect companion to IK’s iRig Mic, the handheld microphone for iOS devices, that allows vocalists and speakers alike to conveniently hold and operate the device at a close distance on the same mic stand with IK’s VocaLive or any other vocal processing app."